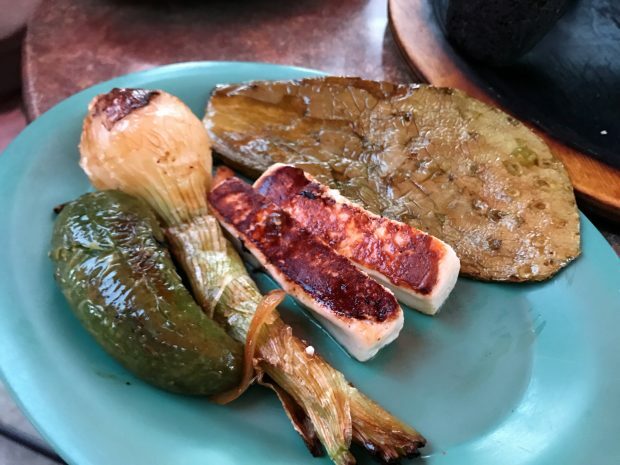 Eating Paleo at El Porton Mexican Restaurant - Oh Snap! Let's Eat! Ok, so what is the big deal with this place? Well, there are some really amazing dishes here. If you’re just looking for the standard American-ized Mexican – they have it here. But that’s not what I’m freaking out about. I’m freaking out about a few things. Here they are and I WILL leave the best to last. This isn’t that cray, I know. It’s Guac. You’ve had it before, I’ve had it before, pretty much any one that’s been to a Mexican restaurant has. But this Guacamole Mexicano from El Porton is pretty delish. Description: “Fresh guacamole made at your tableside!!! Ripe avocados, tomatoes, onions, cilantro and jalapeños with just a hint of lime. Made to your taste..! !” Ok, I feel like the last couple of times I went they did NOT make it at my table side BUT it was still made fresh and it tasted very good. Don’t get this one mixed up with the one they don’t make fresh. That one is not as yum. Love beef? This is an awesome option. Here’s the description: “Beef chunks in a delicious red chile sauce. Served with beans, rice and corn or flour tortillas.” That red chile sauce – mmmmmm, goes super well with the beef! Obvi if you’re going to be all healthy and paleo about it you can skip the beans, rice, and tortilla. If you like pork, you’ve got to try this! Just be warned that this is probably one of the most unphotogenic dish of food I’ve ever eaten (and I’ve had pork brains before). It’s because the pork tips are topped witha tomatillo sauce… it’s just… so green.. and sloppy everywhere looking. But if you can get over that part – zomg so delish. As mentioned, you can skip the beans, rice, and tortilla if your’e trying to be more paleo. Ok, you guessed it. This one is my fave!!! 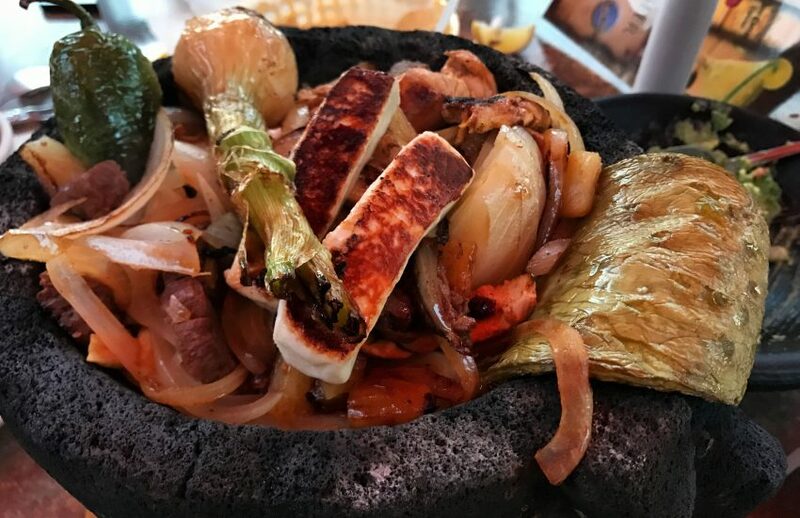 On the menu it’s actually called “Molcajete for two” but last I heard they have a Molcajete for one now. But if you’re a BEAST then you can get the for two for yourself because I’ve actually witnessed this before – it’s that good. NOM NOM NOM. You also get an option to add Shrimp, but since I break out in hives if I eat farm raised shrimps which is what almost all restaurants server, I never get it. I cut these in to pieces so that everyone at the table can share. Some folks eat it with the tortilla, and I’ve tried that before and it definitely goes super well with that cactus IMO, but just FYI that is kind of an acquired taste. If you’re trying to be more paleo, I’d skip the chihuahua cheese (unless you’re okay with dairy. It’s really good.) and the tortilla, beans, and rice. Have you eaten here before? If so, what did you think? If not… here’s their menu! 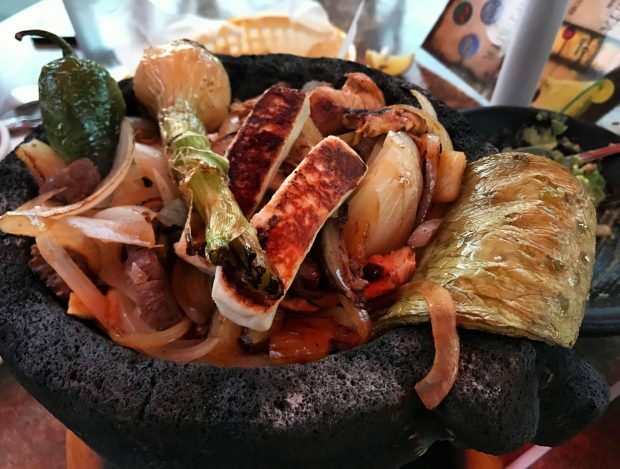 Also, if you’re looking for just general tips on how to eat paleo at Mexican restaurants… there’s this too: Eating Paleo at Mexican Restaurants.